Sharing files can be a hassle. Even when in the same room as the person you want to share files with, the easiest option is often to share them with a USB stick. But when you’re hundreds or thousands of miles away from each other, a USB stick is not always a viable option. Services like Dropbox and Google Drive have made file sharing between individuals easier, but they are also hugely invasive and require a large amount of trust in the provider. Can You Trust the Big Fileshare Services? When handing your files to a third party, you allow them to see the contents of your files and give them knowledge about who you share these files with. 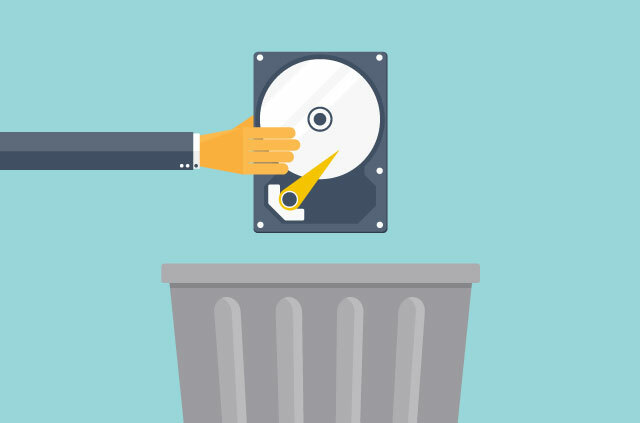 Additionally, there is no guarantee that the files are deleted when the user requests them to be deleted. The files might remain accessible to the operators of the site and an unknown number of governments or hackers. Other alternatives don’t fare well either. FTP servers are hard to set up in an anonymous way, especially if a specific server is repeatedly used. They also cost money. Emails are an option, but an anonymous email provider can be difficult to come by as well, and might also cost quite a bit of money. Today we present a free and easy-to-use tool you can use to securely and anonymously share files with others – as long as you are all online at the same time. The people sharing the files needs to have Tor Browsers installed (which can be downloaded here) and running, as well as get the Onionshare program. Both are available for Windows, Mac and Linux and are straightforward to run and set up. While your files are being shared, you need to have the Tor Browser running in the background. There’s no need to open any website, just keep the Tor browser open in the background. When Tor is running, open Onionshare. Once you open Onionshare, you will be presented with its main window. You can now drag and drop files into this window, or select them manually by clicking on Add Files. You can even add an entire folder with Add Folder. 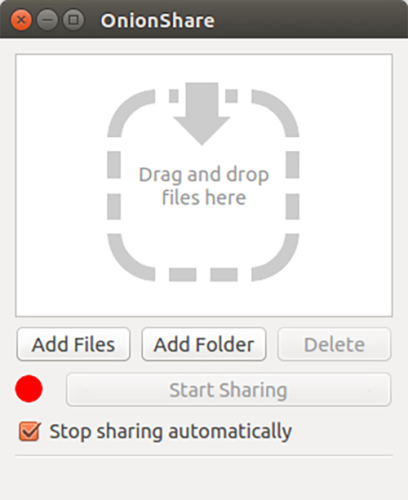 If you have accidentally added a file or decide against sharing it, simply select the file and click on Delete. The Stop sharing automatically button is automatically selected. As long as this option is selected Onionshare will automatically close your connection when the download is finished. This makes sure only one person has access to the files. If you want to share files with more than one person, just unselect this option. To start sharing the files, click on Start Sharing. This step can take a few seconds. In the background Onionshare is creating a hidden service, which is essentially a .onion website hosted on your computer. These services are hidden in a way that makes it near impossible to find out where they are physically located. Even your Internet Service Provider or VPN service won’t be able to tell that you are running a hidden service, let alone which one you are running. You will see a strange looking URL appear at the bottom as soon as the circle turns green. It will also be automatically copied to your clipboard. This is a link to an .onion URL, where the files can be downloaded. You will need to send this url to whoever you want to share your files with. It is important to know that everyone who has this url can download the files. If Stop sharing automatically is enabled, only the first person that clicks to download the files can actually get the files. A great way to share this url anonymously is via Off the Record (OTR). (Check out our guide for how to set yourself up with an anonymous chat account). 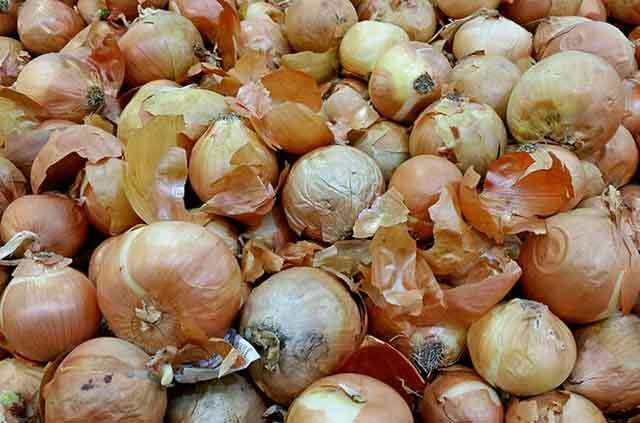 An .onion link must be opened with the Tor browser. This is what the site looks like when opened in the Tor Browser. It’s a good idea to open it yourself before you share the link, to double-check the list of files are the ones you want to share. The recipient can now click on the blue link, which downloads a zip file that contains all the files. Tor isn’t famous for its speed, but in our downloads we achieved about 300-500 KB/s, enough for the most common shared files, such as images and documents. After the files have been downloaded once, Onionshare will terminate the session and let you know if the transfer was a success. When the file has been downloaded, anyone else who navigates to the page will find it doesn’t exist anymore (as long as you selected Stop sharing automatically). And absolutely no records are kept. Onionshare not only keeps the identity and location of the sender and recipient private, it also keeps the two parties private from each other. The program allows you to receive files from somebody who you may not know, without revealing who and where you are — and vice versa. Onionshare was developed by Micah Lee, chief technologist at the Intercept, and board member of the Freedom of the Press Foundation. Previous articleExpressVPN 5.0 for Windows is waiting to meet you!